FOYLE Sailability is urging people with disabilities to experience the thrill of sailing at a free introductory event this Saturday. This fun session entitled 'Try Sailing' will ecourage people from throughout the North West to learn the basics of sailing at Foyle Marina in Derry where a special hoist will allow for ease of access to the sailing boats. The fun taster event is being organised as part of a national campaign called 'Flow - Get into Watersports' co-funded by the EU's Erasmus Plus programme in partnership with SportNI. Foyle Sailability's Access 303 sailing dinghy at Foyle Marina, Derry. 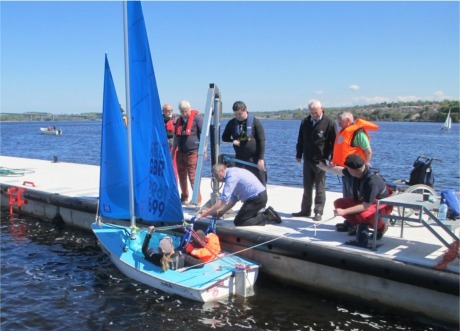 Foyle Sailability chairperson Cathal MacElhatton said: "Our aim is to provide safe and enjoyable sailing opportunities to people with disabilities interested in experiencing the sport of sailing and other on the water activities." Participants will be kitted out with all the necessary equipment and given a safety briefing and introduction before getting into the boats alongside qualified instructors. The event runs from 10.30am to 3pm and will be divided into short sessions. Early booking is advised via foylesailability@gmail.com . Foyle Marina is located just off Baronet Street along the Quays in Derry.